Christmas in Town: Worked on sky blue paper, this unusual design celebrates Christmas in an urban setting and sparkles with gold thread. It stands about 11 cms high. Shepherds' Christmas: This more traditional design is enhanced by four woolly sheep grazing along the bottom. Worked on dark blue paper and shimmering with silvery starlight, it stands about 12cms high. 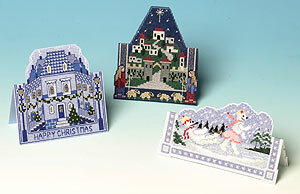 Shepherds' Christmas is also available on its own in our small Christmas cards range. Snow Scene: Skating fun in a snowy landscape with silver sparkles - this scene is worked on periwinkle blue paper and is about 8 cms high.